Epact: Nocturnal And Sundial unsigned, circa 1600 ? This instrument is very similar to Epact 68501, which is also French and has the same combination of nocturnal and vertical disc dial. The example considered here is more complete, and shows that a small compass is missing from the other one. 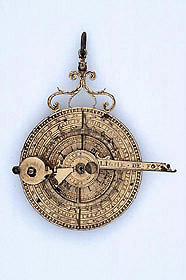 One additional feature here is a volvelle on the vertical sundial side which advises the owner which days in the year are favourable - 'les jours hereux' - and which unfavourable - 'les jours perileux'.